Here are the best running headphones right now, whether you’re jogging in the street, gym, or rainy outside. Are Wireless Headphones the Best for Running? What to Expect of Wireless Bluetooth Headphones for Running? How to Get a Secure Fit When Running? Do they have remote controls and microphone? Introducing, the latest Bluetooth and wired headphones best fit for runners. After thorough research and choosing from over 50 headphone models here are the 12 best. We looked at water-resistance which is crucial if you want your headphones to survive long, sweaty runs. But more important is the fit. Without a secure fit you can’t run comfortably, so all headphones here have a stable fit and shouldn’t fall off even during a sprint. These are the most “running-friendly” headphones on the market whether you’re running outside in the heavy rain or just jogging inside on a treadmill. Check them below. Jaybird X4 are the best running headphones. It’s a brand new model, an update from the X3 version. These IEMs (in-ear monitors) have it all: secure fit, fantastic sound, and verified water resistance. If you want running earbuds that have a secure fit for all ears, fantastic audio quality, and dependable water-resistance, get the Jaybird X4. The earbuds are super comfy and have a fantastic fit. You get memory foam tips that are thermo-reactive and conform to the exact shape of your ear. That provides enhanced durability, noise isolation, rich sound, and secure fit. They are also water and sweat resistant with IPX7. That’s why you can go running in any weather conditions, and you don’t have to worry about sweat. Battery lasts for about 8 hours which is okay for the price. What’s unique is a custom app where you can change the music preset to your liking, more on this below. Their charging cable is proprietary. You cannot use an ordinary micro-USB cable. So losing this cable means you have to buy another one. The audio quality is where X4s really shine. The greatest thing about these is that you can preset your own sound preferences in an app. It’s simple and straightforward. You can boost bass and treble or focus on mids and vocals. Whatever taste you have, they will deliver. Best sounding workout headphones, bar none. Also, if you’re a basshead, these are for you. Because you can set them to emphasize bass and get powerful sound with a touch of a finger (in the app). Jaybird X4 are on the top of our list for many reasons. Their secure fit, water-resistance, noise isolation, and fantastic sound can make your every run fun and carefree. 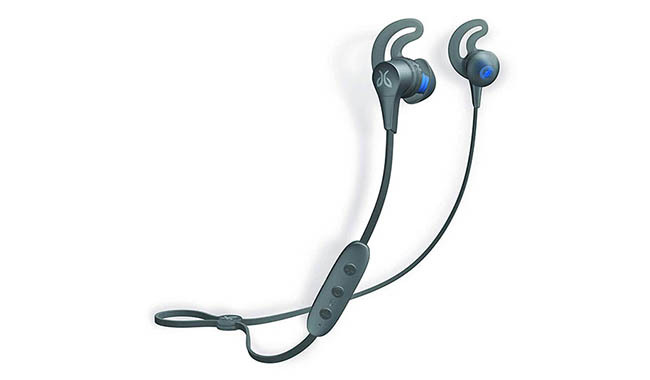 Or check full Jaybird X4 review. Bose SoundSport Pulse are the best running headphones from Bose. Amazing sound quality, high comfort, and heart-rate monitor are just one of the things that make these earbuds so high on our list. If you want to enjoy your music in great comfort plus monitor your heart rate while running, then read on. Their silicone ear tips make them stay in your ears, even during a sprint. They are lightweight so you can forget you’re wearing them. These are not IPX certificated, but still waterproof (IPX rated wireless buds), and can survive most of your sweaty workouts. There’s an in-line remote control to help you manage your tracks and a microphone to make calls. Pulse buds are almost the same to the popular SoundSport wireless. The difference is in the heart rate monitor. Your heart rate can be recorded in the Bose Connect app. This also works with more popular sports app, like Endomodo or Runkeeper. Not the best noise isolation, because ear tips don’t go that deep in your ear. Find top noise isolating earphones here. Also, the battery only lasts about 5 hours which is less than the competition. Their audio quality is satisfying. Sound signature is slightly bass enhanced. It’s good for more motivation while working out. Overall, the sound quality is typical Bose that’s geared towards a general user. 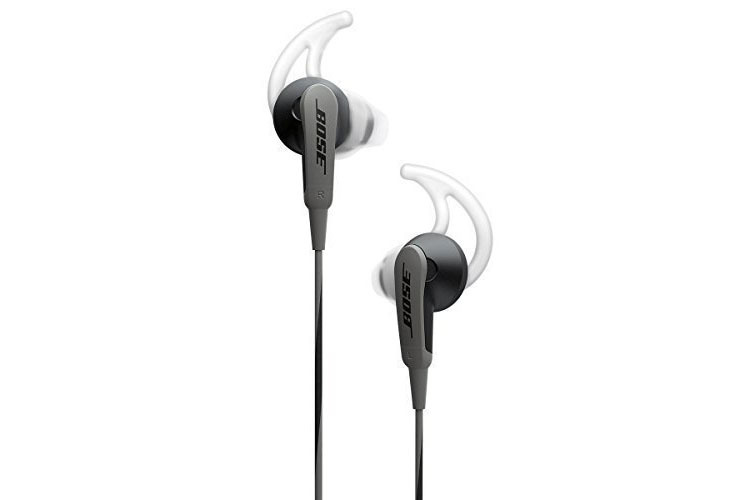 Bose SoundSport Pulse are comfy earbuds, easy for use in a gym or outside. These are specially made for people, who like to keep their heart rate tracked. This makes them perfect for every runner as knowing the stats get you running harder. 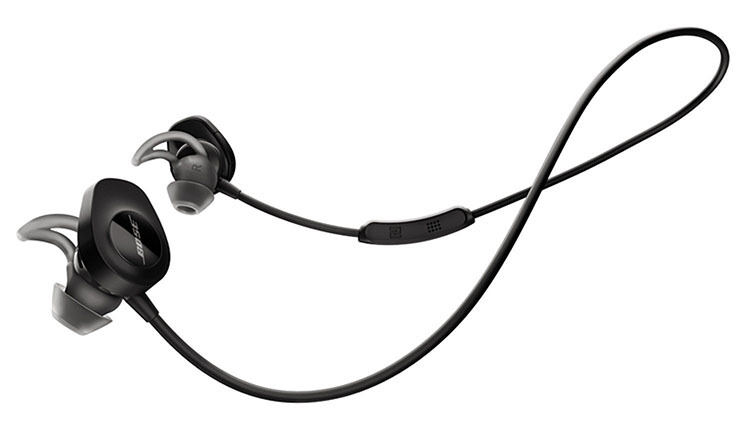 Jabra Elite Active 65t are the best true wireless headphones for running. The overall performance is among the best in the category, and the sports design makes them perfect for a runner. If you’re tired of wires and would like to have earbuds that are stable for sports and especially running, get these. The earbuds are shaped to fit ears nicely. They don’t move around or fall out. Plus, they have excellent noise isolation. You can go running on busy streets and still enjoy your music. These are breathable, and even your longest runs won’t get them hot. With the remote control and microphone, you can control music and make phone calls. You can also connect Siri/Alexa for improved user experience. Although their battery lasts just about 5 hours, there are additional 2 charges in the case, making battery life about 15 hours altogether. People with smaller ear canals might find them uncomfortable. Pricey compared to regular wireless earbuds. Jabra’s sound signature is somewhat balanced. The bass has just the right amount of kick to give that extra push. Their sound is better than most true wireless headphones for sports, so you can enjoy them on a daily basis and get your dose of good music. 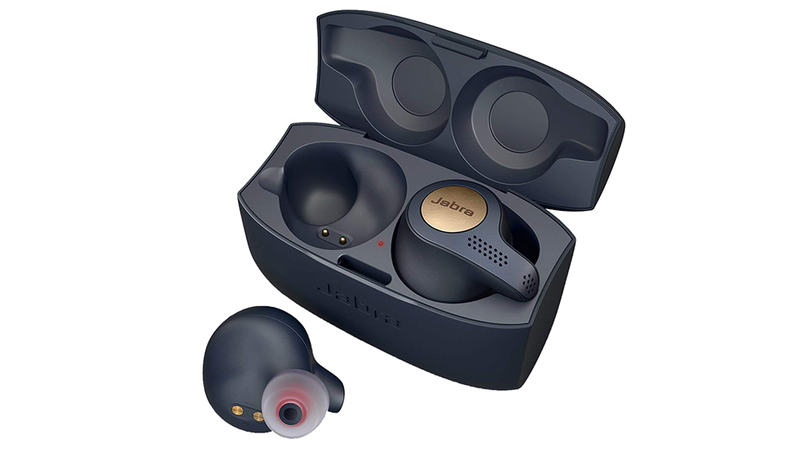 Jabra Elite Active 65t are top-notch true wireless earbuds that will please every demanding runner. 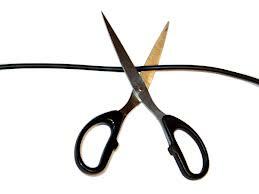 For best in the latest wireless technology, they are the best choice. Bose SoundSport Wireless are one of the best Bluetooth headphones for running. They offer a rich audio experience in a fantastically comfortable package that is perfect for runners. These high-ranking workout earbuds provide hours of quality listening time that is true to the Bose name and quality. StayHear + eartips from Bose offer some of the most comfortable options available, making these earbuds great for long runs. The earbud casing is larger than some other brands, but the StayHear + eartips keep the earbuds in place and secure during your most active workouts. Wearing a winter cap can be an issue, as the earbuds do stick out more than other earbud designs. Bose is known for excellent comfort, and this is what makes them one of the best headphones for running. The Bose SoundSport wireless earbuds are very comfortable, even with their larger earbud size. You can comfortably wear these for several hours of running, in the gym, commuting, or around the house. The in-line controls are very light, and a clothing clip is included, so they don’t pull too hard on one side. Overall, these are definitely one of the most comfortable earbuds for running. These wireless earbuds offer a decent amount of moisture and sweat resistance, but they are not perfectly sweat-proof. The in-line controls have good moisture resistance as well, but be careful not to press too hard on the power button, as this can cause cracking to occur. A nice zippered carrying case with a spring clip is useful for keeping the Bose SoundSport wireless earbuds protected when not in use. The plastic earbud housing is robust enough for most users, but they can break with too much sideways pressure on the two halves of the case. The in-line controls are contoured for a good fit with the cable around your neck. The power button is a bit smaller than the volume up/down buttons, and it can be a little harder to press. There is not a lot of tactile response on the buttons so it can be challenging to feel if a button has been pressed or not, which could lead to the next issue. A common complaint with the controls is that the plastic for the buttons is susceptible to cracking, primarily from pressing too hard. Talkback quality for the built-in microphone on the Bose SoundSport wireless earbuds is solid, allowing for clear phone calls with minimal background noise. 6-hours of battery life is ok, but it isn’t the best. A 15-minute charge will deliver 1-hour of music. Bluetooth range and connectivity are good, and NFC pairing works well. One of the biggest reasons to get these earbuds is excellent sound quality. The sound signature is not necessarily audiophile quality or flat, but it doesn’t overcompensate with too much emphasis on the bass. Lows are warm yet powerful. The mids are presented evenly and openly, without generating too much presence. Highs are reasonably balanced, but higher volume levels can cause them to seem shrill or tinny in the upper end. These earbuds provide a little bit of passive noise isolation, but they will not block out a lot of ambient noise. If you’re a fan of Bose quality, then the Bose SoundSport wireless earbuds are worth checking out. With a comfortable and secure fit, solid audio quality, and a lightweight design, you can easily enjoy long runs with plenty of great sound. 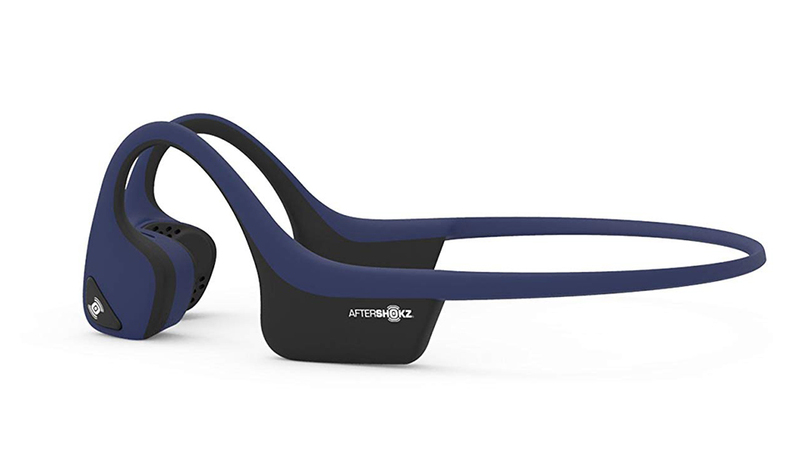 Aftershokz Trekz Air are the best bone conduction headphones for running. 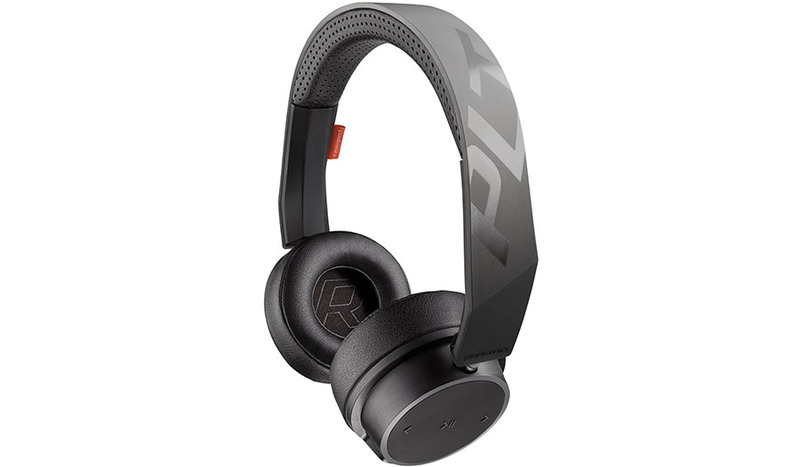 Special wireless headphones made for runners (upgraded from Trekz Titanium). Plus, with this version you get reflective strips for better visibility, perfect for runners. If you want to stay aware of your surroundings while listening to your favorite songs on the run, these are your best choice. Trekz Air are super comfortable and durable in-ear headphones. Comfort comes from the fact that they don’t go into your ears, but rather nearby your ears. They stay in their place, no matter how fast you move. Plus, they are water resistant with the IPX5 rating. The open-back design makes them perfect for everyone that would like to maximize their awareness in loud streets. The bone conducting technology is an excellent alternative to regular headphones. You can still listen to music in relative quality. They, understandably, don’t have the best noise isolation. So these are not suitable for people that would like to silence the world around them. Plus, the battery life is just about 6 hours. You cannot expect to get an audio experience the same as you would with traditional in-ear headphones. But, these still produce quite a pleasant sound. High and mid tones are well present, but bass is lacking. Aftershokz Trekz Air are specially designed headphones with water-resistance, extreme comfort, and decent sound. They are suitable for people that want to try something new and would like to pay more attention to the world around them when running. The best running headphones for tracking personal stats. Vi Sense is more than just headphones. They can be your trainer and motivator as well. If you need little extra push of motivation and if you want to make the most of your runs, Vi Sense is a great option. The headphones are extremely lightweight. Their tight fit in your ear provides good noise isolation, as well as comfort. They are entirely sweatproof, so you don’t have to worry about them getting wet. The battery lasts up to 8 hours. Bluetooth connection is reliable and doesn’t disconnect. The best thing about them is that they work as your personal trainer. They track your heart rate, your distances, and your progress. With all that, they can calculate the perfect workout for you. These earbuds are super fun because they ”talk” to you and make you feel more inspired in your workouts. Plus, the stats give you more reason to stay motivated. Although you get a free app subscription for one year when you buy them, you have to pay for it later on. The sound is powered by Harman Kardon. It is rich and delivers high quality even when you’re on the move. All ranges are well balanced. This is maybe disappointing for people, who like emphasized bass. Vi Sense tracking earbuds offer a lot. Having great comfort, high audio quality and being your personal trainer are just some of the things you get. If you want a more scientific approach to running, they are the best choice for you. The best cheap wireless earbuds for running. The Origem HS-1 (full review) are wireless in-ear headphones with a sporty fit and great water-protection. If you’re looking for inexpensive Bluetooth earbuds that have a suitable fit for running, check these out. With the price under $40, they are one of the most affordable wireless earbuds for running. You get everything more premium headphones offer. A marvelous battery with up to 10 hours of playtime, a mic for calls, remote control for easy control of music and a durable design that fits well. Add to this a nice selection of ear tips—you even get memory foam tips—that make the comfort even better. Origem HS-1 are great cheap wireless earbuds, but aren’t without faults, more on this below. The first thing you’ll notice is their big size. The earbuds are sticking out of your ears quite a bit which might be a concern for some people. Also, the Bluetooth connection tends to distort when you put a wall in between the headphones and your smartphone. Keep your device close to you to solve this problem easily. It’s a good thing sound quality doesn’t disappoint. For a budget product, they sound well. They are loud and have emphasized bass and highs (V-shaped sound) that is perfect for EDM, Hip-Hop and other modern music. aptX support is present too. And even at just half volume, they are still louder than many Bluetooth headphones. For great value-for-money running headphones with Bluetooth, stable fit, microphone and water-protection, Origem HS-1 is your best choice. Wires are still kicking strong. Here are the best wired earphones for jogging. You can also check the guide on the best wired workout headphones. The best wired running in-ear headphones. …but still, offer great value for money because no other headphones provide the same combination of features that are as perfect for running as these. The combination of stable fit, incredible comfort, sweatproof design, and strong bassy sound makes Bose SoundSport the best wired running headphones, period. You get what you pay for, and if you want something better to take along on your runs, this is it. The earbuds are a bit shallower than your average IEMs (in-ear monitors), so they don’t go that deep into your ears. This helps with environmental awareness, the passive noise isolation isn’t high so you can hear what is going on around you at all times. Bose is known for making very comfortable headphones, and these are no different. Running marathons is hard enough, you don’t need to be bothered by irritated ears as well. The earbuds are very light, and you will soon forget you’re wearing them altogether. The ear tips are made out of quality, soft silicone and feel right inside the ears. The earbuds are plastic with rubber protected cord. True, there is strain relief on all crucial parts, but we’ve seen better before. Also, the 3.5mm jack is I-shaped which isn’t optimal but does the job. While physical durability is about average, water and sweat resistance are better. They are completely sweatproof and can survive a downpour or two, so no worries of getting caught in the rain. We wouldn’t wash them under running water but instead use a wet cloth to clean them. Consequently, as long as you don’t throw them around or pull on them too hard, they should serve you for many years of your running career. The remote controls are very intuitive, and very soon you’ll be changing songs, adjusting volume and accepting calls without having to look at what you’re pressing. Similarly, the microphone sound quality is also pretty good for an in-line mic. Your voice is heard well and clearly. The sound quality doesn’t disappoint either. It’s typical Bose sound signature, somewhat emphasized bass with clear mids and highs. While this may not be a balanced audiophile signature, it produces fun and dynamic sound that is perfect for running. Since these aren’t real IEMs but shallower, the microphonics is nonexistent. This means the cables don’t make noises if they’re flapping around when running. This is an essential thing for a runner. Overall, as long as you can enjoy stronger bass, you’ll be pleased with how these sound. MEE Audio X1 are the best budget earbuds for running right now. The X1 are almost the same to the popular M6 except they also have an in-line microphone and remote control. Note: there are better sounding, better built and probably even more comfortable earbuds out there, but you can’t get all of this together for such a low price. More cheap earbuds here. 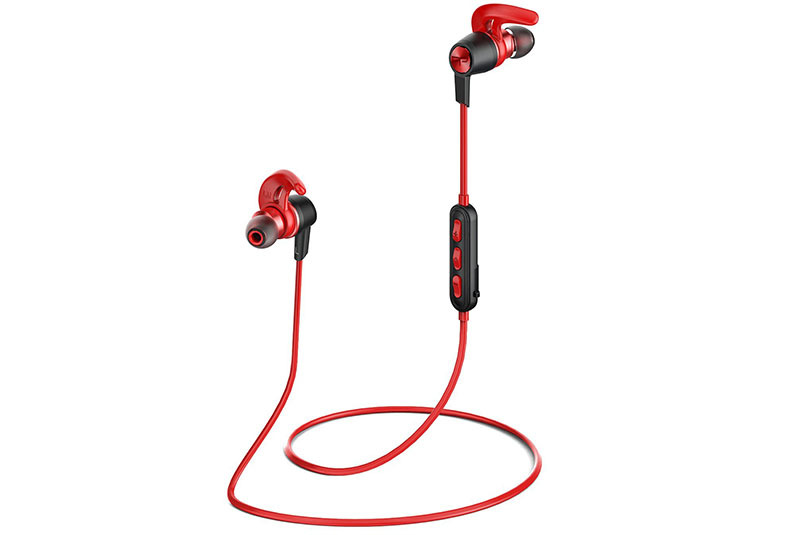 In fact, these are one of the most popular running earbuds on the market because people aren’t using them just for sports but for everyday use as well. The fit is very stable once you adjust the memory ear hooks. It needs some getting used to, and in the beginning, it might be annoying putting them on. But once you find the right fit for your ears, it’s just like putting other headphones on. In the package, you get a nice selection of ear tips, 6 in fact. Try them all and see how the sound and noise isolation change. At the same time, you can lower noise isolation by picking smaller, less tight fitting ear tips for outside running. You do have to hear what is going on around you if you run outside on traffic-heavy streets. Comfort is outstanding. They are small and lightweight which helps (little enough to fit a kid too). 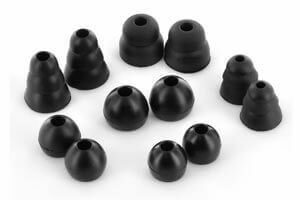 You can choose from 6 different silicone eartips, but you can also get memory foam tips for absolute comfort and noise isolation if that’s what you want (it costs a bit more money). The memory ear hooks are a bit softer and need some molding, but once in position they don’t create any discomfort even during fast movement. After a while, you’ll forget you’re wearing them and just focus on running. MEE Audio X1 are IPX5 water- and sweat-resistant, meaning you can easily use them in the rain and the sweat your body produces won’t be any problem at all. Some things have been improved over the older M6 model. The wires are thin but have a nice layer of durable rubber that inspires confidence. All the weak points are strengthened, the Y splitter is not plastic, and the I-shaped plug has been replaced with a more durable L-plug. 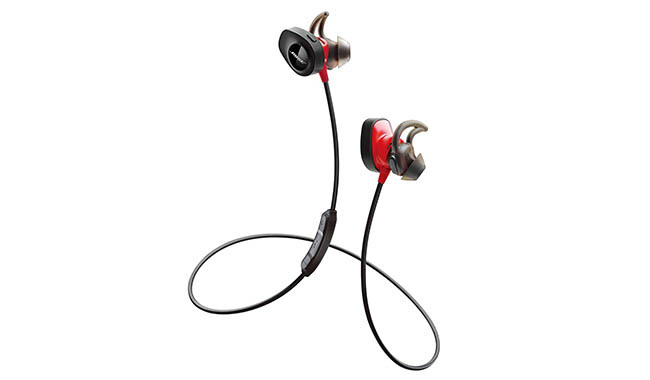 Overall these sport earbuds are very durable and perfect for running in all conditions. There are 2 models to choose from. The regular M6 doesn’t have any controls or microphone, but for a few bucks more you can get the X1 version that does. If you don’t make phone calls during your runs, get the cheaper version and save some money. Another thing worth mentioning that you get is a nice hard carrying case that fits in small pockets and any gym bag. You also get a shirt clip which can be very useful for running. Considering these are budget running earphones, you’re getting a lot of useful accessories. The sound is probably the best feature of MEE Audio X1. They have a bassy sound signature, but the bass is controlled, pretty clear and it doesn’t overpower other ranges. You can find more bass buds here. Mids and highs come to life as well, highs are a bit harsh sometimes, but they aren’t too annoying. To get that deep, tempo setting bass, you need to get an airtight seal. You should test all the ear tips and find the ones that best suit you. In case you don’t want strong bass, you can easily pick looser eartips, and you’ll get a more balanced sound. Microphonics is minimal at worse. It’s almost non-existent, and the wires don’t make much noise when rubbed against your clothes. Use the shirt clip, and you won’t have any problems. If you like fun and warm sound with stronger bass than these earbuds are perfect for you. 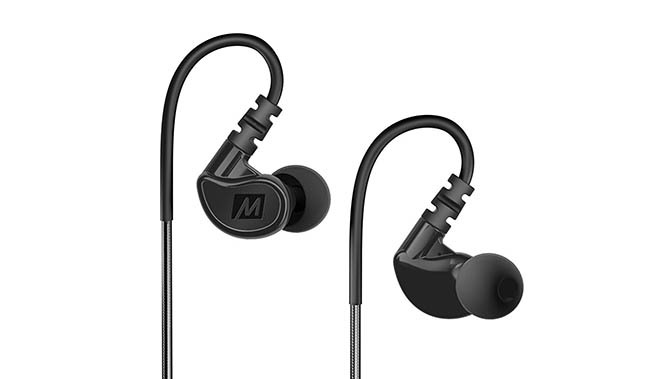 Overall, if you’re looking for dedicated running headphones with great sound, durability, fit, and comfort, which are suitable for all conditions, all for a dirt cheap price, MEE Audio X1 are your best choice. Here are the top wired and wireless on-ear headphones for running. On-ear (supra-aural) are better than over-ear headphones, since the over-ears (circumaural) are just too big and wobble around too much. 66 Audio BTS Pro are the best on-ear headphones for running at the moment. 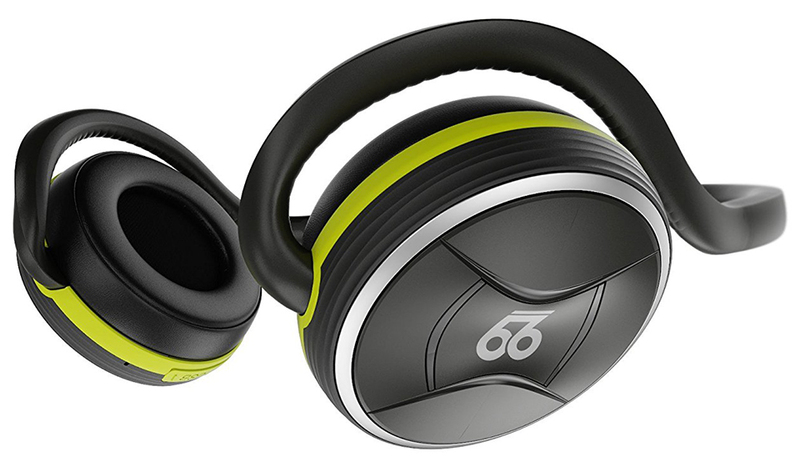 On-ear 66 Audio BTS Pro headphones are the top choice for on-ear running headphones. Because of their sweat resistance, high comfort, fantastic battery, and customizable audio quality. If you don’t like in-ear monitors, but still seek great running headphones, read on. Even though they are on-ear headphones, they are suitable for running because of the ear-hook design (results in a stable fit). They are quite comfortable, due to their lightness and memory foam earpads. Plus, they are fully sweatproof. In contrast, their noise isolation isn’t as good as with earbuds, but this can be useful for ambient awareness. 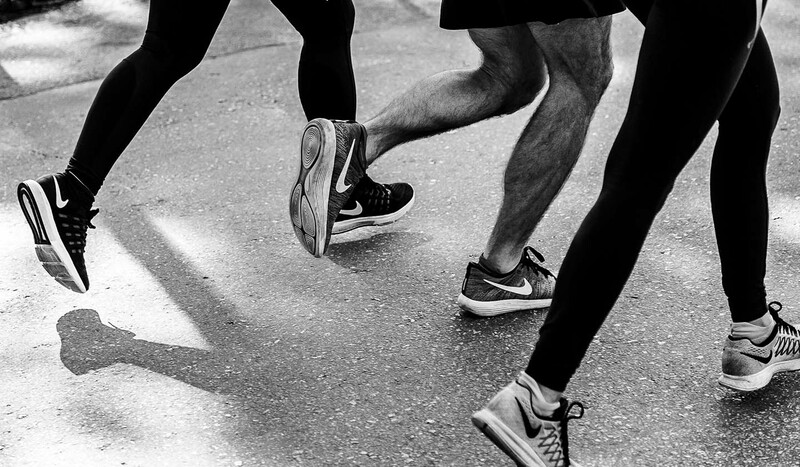 If you’re regularly running in busy and loud streets, it’s vital you hear the incoming traffic. Looking for the best noise cancelling earbuds? Moreover, their battery life is impressive – it can last up to 40 hours. Add AAC and aptX low latency support and custom EQ app, and you’ll understand why these offer fantastic value for money. They can get uncomfortable after a long workout session, because of the pressure they make on the ear. Although these are not that expensive, they provide high-quality sound. It’s somewhat balanced, suitable for all kinds of music. But the cool feature is the equalizer app where you can change the signature to your preference. In the end, the 66 Audio BTS Pro on-ears are a great choice, because of their lightweight, waterproof design, great fit, comfort, exceptional battery life, and custom audio quality. The fact you get all of this under $100 is a bargain. A solid on-ear alternative for runners. Plantronics BackBeat FIT 500 are wireless on-ear headphones, providing sweat resistance, long battery life, and pleasing sound. If you want solid on-ear headphones you can run with and not worry about killing them with sweat, BackBeat FIT 500 are a great choice. These on-ears are lightweight and comfortable with good noise isolation. They stay on your ears even when running fast which makes them a suitable contender for runners. The battery life of up to 18 hours and stable Bluetooth connection helps you focus on your running only. They also have Multipoint (connect 2 devices), built-in remote control and microphone you can use for calls. Because they are supra-aural headphones, your ears might hurt a little after extended use. The sound they produce is rich with bass. Mids and highs are clear too, but bass is always in the front. That is perfect for everyone that likes punchy, loud bass. It’s a bassy sound, and that’s what a lot of runners love. 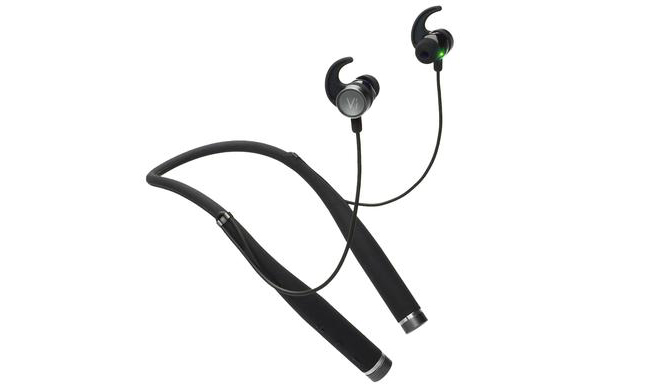 Plantronics BackBeat FIT 500 are bass enhanced wireless on-ear headphones with waterproof design. On top of that, great comfort, tight fit, and relatively affordable price make them ideal for runners. The best bang for the buck jogging on-ear headphones with wires and retro design. Excellent sound quality with fantastic comfort makes them perfect for all types of activity. If the price of around $20 is still too much for you, you can check Koss KSC75 which are a similar design, but even cheaper. Because of their lightweight nature, you will barely feel them, and for the same reason, they won’t move on your head even during fast running. Keeping them on is very easy, so these are suitable for working out in the gym or doing yoga. Adjust the flexible headband to your head size, and you’re good to go. Because they are an open-back design, they have almost no noise isolation. If you turn up the volume, you leak quite a lot of sound so keep that in mind when using them with others around. At the same time, bad noise isolation helps with environmental awareness in case you run in urban areas where you have to watch out for the cars and pedestrians. Interested in noise cancelling headphones? 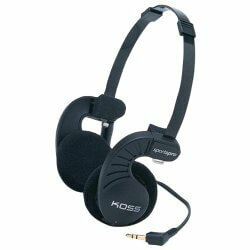 Koss SportaPro are very comfortable headphones. The reason is their ultra-light design that doesn’t have the weight to put any pressure on your ears. It’s a good thing they are so cheap, and when they break on you, you can just buy new ones for less than $20. In fact, with such low price durability stops being an issue, because if you get 1 year out of them, this will be money well spent. They don’t have any special sweat protection like other sports headphones, these are just regular plastic and metal headphones. They can survive some sweat, of course, just don’t drench them in water. They don’t have any controls, just a regular cable with a 3.5mm plug at the end. Hey, these are a budget model after all. Sound quality is what makes these an excellent choice for sports. The bass is strong, but controlled and punchy and gives a good rhythm. The highs and mids are clear and detailed and together with great bass response make for a fantastic sound that is perfect for sports. Overall, if you don’t mind the retro look, Koss SportaPro have stable and comfortable fit with amazing sound that will make you enjoy every mile. Before you pick your running headphones, you need to know where and how you’ll be using them. If you run outside in all weather, even rain, you need good waterproof headphones. IPX5 and more is recommended as this ensures complete resistance to rain and sweat. In case you run inside on a treadmill, you don’t really need extra water protection unless you sweat excessively. It’s still beneficial if the headphones are sweatproof but not crucial. Getting a stable fit is crucial. A stable fit is the most important thing when choosing solid headphones for running. If they don’t stay in, you won’t be able to run with them. It’s simple as that. Because of fast movement, big, bulky headphones aren’t really suitable for running. The most common sports headphones are small in-ear designs. They are lightweight and offer good stable fit. But in case you don’t like earbuds (IEMs), lightweight on-ear headphones are a good alternative. Sound quality is important but not crucial. You probably won’t be focusing on the details or lack thereof during a run. The brains are very busy with other things during exercise, like breathing and body coordination. On the other hand, you still want quality, engaging sound that will make you go the extra mile. A bass heavier sound signature is preferred by many people, but it really comes down to personal preference. If you like rock music and more of a balanced sound signature, then you should look for that. But if you listen to audiobooks and podcasts, any decent headphones will do. How much noise isolation do you need? There are 2 options. Closed-back and open-back headphones. Closed-back headphones have far superior noise attenuation and are best for running inside when you want to keep private. Or running in nature, on a safe path where you don’t have to worry about the dangers of traffic. Also, effective noise blocking means you won’t bother other gym-goers with your loud music and will instead keep it to yourself. It’s a behavior of a civilized person. On the other hand, open headphones leak in and out a lot more ambient noise. But this isn’t bad in every case. If you’re running on busy streets with “blood-lusting” drivers, hearing ambient noise is an advantage. And in many cases a necessity for a safe run. Sure, you’ll hear less music because noise will overlap it, but what’s more important? Your safety or your enjoyment of music. It’s your call. Now just because the noise bothers you doesn’t mean you should turn up the volume to max. You can damage your hearing fast if you’re not careful. More on this here. Don’t forget that open-back design leaks sound in and out. Meaning, other people will hear what you’re listening to which can be embarrassing, depending on your music taste. Good comfort always plays a role. Pick earbuds with many variations of eartips so you can change them to fit your ear canal comfortably. This is where the built-in (or in-line) controls become useful. There are many iPhone and Android compatible headphones that will make controlling music much easier. There are many great picks on this page that do great in all the categories. With wireless headphones, you’ll never have to deal with untangling the mysterious mess of wires before a run. There’s also less of a chance to damage the headphones beyond repair. With most headphones, if cord goes, headphones go. You feel free to do anything you want. You’re not limited by the wires or the audio player. The freedom wireless headphones give you is liberating. But it comes with a price. The biggest one being the battery charging. You’ll need to regularly recharge your batteries otherwise your Bluetooth cans won’t work. Now, some on-ears have the option to use them wired as well which is always useful. The other thing you should expect is that the battery capacity will diminish over time. It’s the fault in the technology that isn’t made to last forever. Over a couple of years, your headphones will lose battery space. There’s nothing you can do about it. Audio quality might not be up to par. Now, every audiophile will tell you that wireless headphones don’t sound as good as wired. While this is technically true, the difference is minimal. So, barely anyone can hear the difference. You need professionally trained ears and be younger (hearing diminishes with age) to notice a difference. If you’re not an audiophile and just want to enjoy quality music and have fun, you don’t have to worry about it. Moreover, you might experience temporary interruptions. Because Bluetooth technology isn’t perfect, you will sometimes get the unwanted distortion or loss of signal. It happens to the best of them. Fortunately, with later versions of Bluetooth, these problems are becoming less common. When it comes to on-ear, supra-aural headphones, it’s very straightforward. The cans need to have strong clamping force and be light enough, so they don’t move around during a jog. Many have the ear hook-shaped headband to help with stability. For in-ear headphones, there are many options. Some earbuds allow both fits, some only one. It depends on the model. We found over the ear fit to be more secure because your earlobes give more support to the cables. But both can work well for running. Check the video explaining how to fit buds over the ear style. Here is a video explaining how to fit Vi Sense (mentioned above) in an under the ear fit. Do you use some other awesome headphones for your running? Let us know in the comments. Add your own favorite model so other people can vote for it, if it gets enough votes, we might even review it ourselves.